The camping programs offered by The Romanian Orthodox Episcopate of America are an extension of the Church's sacred ministry to her young people. 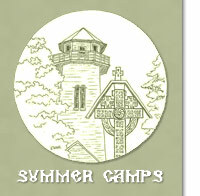 For over 50 years, these camps have given children from across North America an opportunity to practice and learn about their Faith while spending recreational time with other young Orthodox Christians. Students are given both the knowledge and encouragement necessary to build a strong spiritual life which will be of great benefit to them throughout the years to come. CLICK HERE for the Camp Vatra Facebook page. Click on the images below for more detailed information, registration forms, etc.